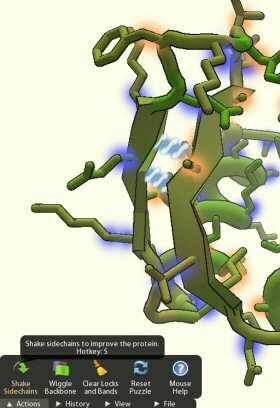 Researchers at the University of Washington (UW) have turned protein folding into a competitive computer game and are hoping to harness the brainpower of gamers worldwide to make medical breakthroughs. Their game, called Foldit, uses people’s natural 3-D problem-solving skills to tackle conundrums in how protein strands curl and twist into three-dimensional shapes. Proteins, of which there are more than 100,000 different kinds in the human body, form every cell, make up the immune system and set the speed of chemical reactions. While science understands the genetic sequence of many proteins, we don’t know how they fold up into complex shapes whose nooks and crannies play crucial biological roles. In creating the game, which resembles Tetris on steroids, the developers faced some special challenges that commercial game developers don’t encounter. “We don’t know what the best result is, so we can’t help people or hint people toward that goal,” Popovic explained. The team also couldn’t arbitrarily decide to make one move worth 1,000 bonus points, since the score corresponds to the energy needed to hold the protein in that shape.